Speaker of the House Nancy Pelosi, D-Calif., takes questions from reporters, Friday, Jan. 18, 2019, on Capitol Hill in Washington. WASHINGTON — President Donald Trump made a new offer Saturday to Democrats aimed at ending the 29-day partial government shutdown that would extend deportation protections for some immigrants in exchange for $5.7 billion in border wall funding. Trump’s proposal is designed to ramp up pressure on Democrats by offering a reprieve on his attempts to end Deferred Action for Childhood Arrivals (DACA) and temporary protected status (TPS) for immigrants from some Latin American and African nations. Under the new proposal, the administration would allow those programs to continue — addressing a key concern of Democrats and some moderate Republicans. It would also grant hundreds of millions of dollars for humanitarian assistance and drug detection policy and call for the hiring of thousands of new law enforcement agents to be deployed on the southern border. Trump said Senate Majority Mitch McConnell, R-Ky., will put the legislation on the Senate floor for a vote next week. But some Democrats rejected Trump’s offer as unacceptable before it was officially announced.House Speaker Nancy Pelosi, D-Calif., called it a “non-starter” and implored Trump to take action to open the government. It’s not clear whether the offer would be enough to break an impasse that has resulted in 800,000 federal workers to be furloughed and numerous government agencies, including the Department of Homeland Security, to operate at minimal staffing levels. The shutdown is now the longest in U.S. government history. Ahead of his remarks from the White House, Trump oversaw a naturalization ceremony in the Oval Office for five new Americans, who took the Oath of Allegiance from Homeland Security Secretary Kirstjen Nielsen. The event aimed to underscore Trump’s support of foreigners who enter the country through legal immigration programs, even as his administration has supported policies to slash overall immigration levels. Democrats have been under pressure from immigrant rights organizations not to give Trump funding for a wall. And Trump’s offer would not provide a path to permanent legal status — or citizenship — that many Democrats have sought in any immigration deal that would dramatically ramp up border security measures. Pelosi said Democrats will pass legislation to re-open the government next week, after which Congress will negotiate border security. 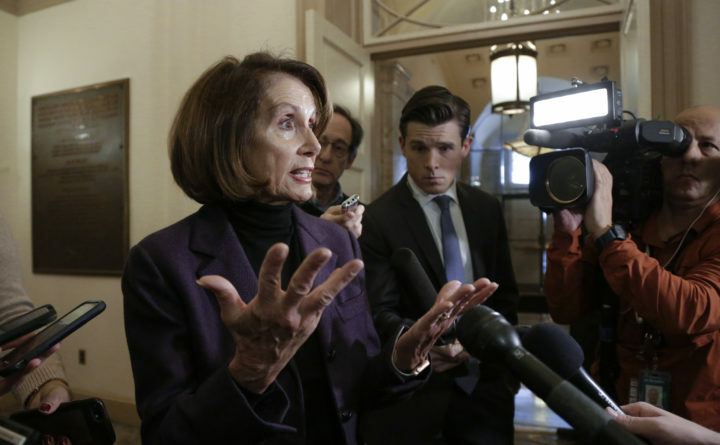 Pelosi said Democrats will also pass six bills agreed to by House and Senate negotiators. “The President must sign these bills to re-open government immediately and stop holding the American people hostage with this senseless shutdown,” Pelosi said. A senior House Democratic aide said Democrats were not consulted on the plan, which the aide said is “not a compromise” because it still includes Trump’s demand for $5.7 billion to build a wall on the U.S.-Mexico border — the request that led to the shutdown. Trump also could face blowback from conservatives, including prominent commentators, who have opposed any attempts to extend deportation protections from undocumented immigrants. Axios first reported the details of Trump’s proposal. Trump had indicated for weeks that he would not entertain an extension of DACA, which began in 2012 under President Barack Obama and has offered renewable work permits to immigrants, known as “Dreamers,” who entered the country illegally as children. Trump had said he was hoping the Supreme Court would hear an appeal to a lower court’s injunction on his attempt to end DACA and, if the high court ruled in his favor, that ending the program would give him more leverage in talks with Democrats over the future of the Dreamers. But the Supreme Court signaled Friday that it might not take the case. That would mean that Trump would remain unable to end DACA, which covers about 700,000 immigrants, and some Dreamer groups have called on Democrats not to cut a deal for the wall. The Democratic aide said the proposal Trump will make on DACA Saturday does not fully protect “dreamers” and is not a permanent solution to the issue. On TPS, Trump has declared an end to a program that has offered hundreds of thousands of immigrants from El Salvador, Nicaragua, Haiti and Sudan the right to remain in the United States after they were uprooted from their home countries during national disasters and other emergencies. But Trump’s move also has been enjoined by federal courts. Trump told reporters at the White House on Saturday morning that he will make an “important statement” that afternoon, and continued to point to a new caravan of Central American migrants crossing into Mexico from Guatemala that was the subject of segments this week on “Fox & Friends” as one reason for the wall. “If we had a wall, we wouldn’t have a problem. But we don’t, we have too many open areas,” he said. Aides to the top Democrats in Congress — Pelosi and Senate Minority Leader Chuck Schumer, D-N.Y. — said late Friday that they had received no new offer from the White House. The ongoing shutdown of some 25 percent of the federal government was triggered by Trump’s demands for $5.7 billion to build more than 200 miles of new wall along the U.S.-Mexico border. Pelosi calls the wall “immoral,” and Democrats are refusing to offer more than $1.3 billion to extend existing funding levels for border barriers and fences. Democrats also frequently point out that Trump long claimed Mexico would pay for the wall. Absent negotiations, the impasse has devolved into bickering between Trump and Pelosi, offering little comfort to the 800,000 federal workers who have gone without pay since Dec. 22 and have been forced to rely on food banks or other jobs. The fight escalated on Saturday, with Trump telling reporters he hopes Pelosi can “come along and realize . . . that walls work.” Trump was asked if the shutdown had become too personal between himself and Pelosi. A spokesman for Pelosi did not immediately return a response for comment. Sen. Tim Kaine, D-Va., said Saturday that Democrats have shown repeatedly in the past that they’re willing to provide border security funding — but stressed that Trump must first agree to reopen the government before such discussions can resume. “Reopen government and we’ve shown you by our past actions and past votes that we’re willing to have a discussion,” he told reporters on Capitol Hill. Kaine, the Democratic Party’s 2016 vice-presidential candidate, said the dollar amount Trump is requesting to build a wall isn’t the problem — it’s how to best use the funding. “The dollar amount has not been the challenge, the issue is do you use the money in the right way or the wrong way, and I think what our goal is we don’t want to use the money the wrong way,” said the senator. A proxy battle — a political clash like few others — emerged over the past week between the leaders of two of the nation’s three branches of government as they leveraged the powers of their offices against one another, all the while trying to shape public sentiment. Pelosi suggested this past week that Trump reschedule his Jan. 29 State of the Union address on Capitol Hill due to security concerns stemming from the nearly month-long partial government shutdown. He retaliated with a last-minute cancellation of her trip with other House members to Afghanistan using a military aircraft. On Friday Pelosi accused Trump of putting herself and fellow lawmakers in danger by publicizing their plans to travel to Afghanistan, forcing them to abandon the trip. Pelosi said the State Department had determined that the trip, even using commercial aircraft, could no longer be made without endangering the safety of lawmakers, as well as of troops and support personnel due to the president’s actions. The White House has forcefully denied Pelosi’s claims. Meanwhile, the furloughed workers and those forced to work without pay will soon miss another paycheck unless the shutdown is somehow resolved, a fact that White House press secretary Sarah Sanders said Friday made it imperative for Pelosi to stay in the country this weekend. “That’s one of the key reasons that the president did not want Speaker Pelosi to leave the country, is because if she did it would all but guarantee the fact that negotiations couldn’t take place over the weekend,” Sanders told reporters at the White House. But Pelosi’s spokesman, Drew Hammill, said the White House had not sought to schedule negotiations with the speaker for this weekend. The impacts from the shutdown have spiraled in various directions despite efforts by the administration to limit them by calling workers at agencies including the IRS and State Department back to work, in most cases without pay. Federal Reserve Bank of New York President John Williams on Friday said the shutdown had created “head winds” to economic growth, and a key measurement of consumer confidence — released by the University of Michigan — has fallen to its lowest level of Trump’s presidency. The White House and Democrats are in agreement on the need for border security generally and even on some specifics of what that would entail — just not on the wall. Next week the House will take up another batch of spending bills aimed at reopening the government without funding the wall that will include some spending directed to the border. One bill will include $563 million for immigration judges, the same figure Trump has requested; another will include $524 million to expand facilities at ports of entry along the border. Washington Post writers Paige Winfield Cunningham, Philip Rucker, Josh Dawsey, Paul Kane and Damian Paletta contributed to this report.